Image quality is better than ever and projection options are available to meet varying business needs. Choosing from among the many options, however, can be daunting. Understanding the technologies most useful for the needs of a business, along with key specifications affecting image quality, is a helpful starting point. Before considering the equipment itself, take a step back to assess your needs and installation conditions. This helps to ensure a best-fit projector solution for any given business application. Consider room size. Number of attendees. Lighting conditions. Multiple projectors. Presenter needs. You also need to think about the type of content to be displayed, interactivity goals, and the desire to avoid distracting shadows need to be considered. Each of these needs is addressed by a specific projection characteristic. Buying a projector that meets your needs offers the best projector solution. Ultra-short throw projectors do the most to minimize shadows. Networkable projectors deliver time-saving centralized control. Interactive projection technology delivers the added collaboration shown to improve learning outcomes. Finally, you will also want to assess connectivity features and ease of use. Before delving into each of the categories and specs above, we’ll first take a look at why projection continues to present an ideal business display solution. The use of large-screen LED displays in a business environment is a relatively recent trend, fueled largely by the increasing availability and decreasing cost of interactive display systems. Both projectors and large-screen LED displays can offer an effective office viewing experience and each offers different features and benefits. Lower overall cost – Projectors offer the best value in terms of cost per screen inch, even when factoring in the cost of replacement lamps and a projection screen. Large screen LED displays are significantly more expensive. Image size – Projectors deliver much larger images than possible with a flat-screen display. Depending on room size and lighting, many projectors are capable of projecting an HD image up to 300 inches diagonally, whereas LED displays have a fixed screen size. And, as noted above, the cost to project the standard 60 to 80-inch screen size found in most offices is considerably less than it would be to purchase a comparably sized display. Viewing angle – LED displays look great to attendees seated directly in front of them, but for those seated at an off angle, the image can be compromised. Projected images stay true regardless of the viewing angle. Space-savings – Paper-thin projector screens and a ceiling-mounted projector take up less space than a large screen display. Additionally, projector screens can be easily retracted, rolled up and stored away when you want them out of sight. Easy on the Eyes – Because flat screen displays are typically smaller and brighter than a projected image, they tend to be harder on the eyes. Projected images, with their lower brightness and larger image sizes that fill a larger percentage of the visual field, can help reduce eyestrain and fatigue. Fortunately, the advent of networkable projection solutions has reduced the time and cost burden of managing multiple projectors across multiple locations. Networkable business projectors enable more efficient and cost-effective management of projection assets. The result is improved overall projector TCO and greater projector availability. Connected to a wireless or wired local area network (LAN), projectors with networking capabilities can be installed across any size office or corporation, then remotely operated and monitored. These expanded operating capabilities allow presenters to deliver their content to one or more projectors from any location with network access. In a large enterprise or training environment, this enables a single presenter to transmit the same presentation simultaneously to several offices or meeting rooms. The possibilities for cost-effectively extending presentation or training opportunities are limitless. The remote management capabilities enable IT staff to monitor and control the functionality of all projectors from a single PC, eliminating the need for actual physical contact with each projector to perform routine maintenance tasks. Real-time email alerts provide updates on everything from power status, lamp life and unit presence. Room size – along with any other space constraints – must be taken into consideration along with the desired size of the projected image. For all projectors, the further they are from the screen, the larger the projected image and the larger the projection screen needed. Projectors differ, however, in the distance they must be from the screen to project the same size image. 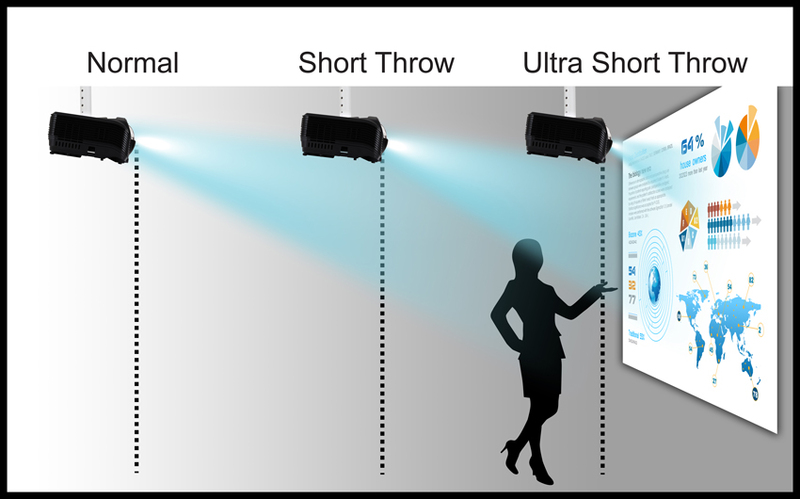 Projectors are classified as regular, short, and ultra-short throw. For example, if a room has an 80” projection screen, a standard throw projector will need to be at least 7- 8 feet from the screen. A short throw projector will need to be 3-3.5 feet. An ultra-short throw projector can be as close as 2-2.5 feet from the screen. In general, a regular throw ratio is 1.1 and above; short-throw projector ratios are from 0.6 to 0.8; ultra-short throw ratios are anything less than 0.5. 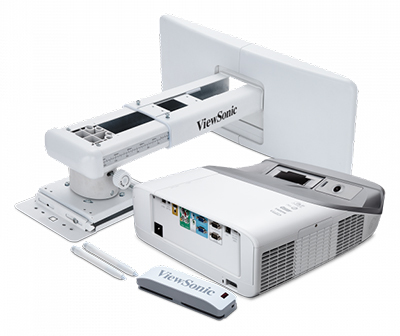 In many rooms, it can be difficult to properly project a reasonably-sized image with a standard throw projector. In smaller rooms, the projector will need to be placed close to the screen – resulting in a smaller projected image size less easily seen by the entire room of attendees. Even in larger rooms, standard throw projectors placed behind attendees can present problems by introducing distracting lights and shadows. Because of these constraints and concerns, projectors with a shorter throw distance offer an ideal solution for businesses by enabling the projection distance to be reduced by more than half. Projectors equipped with a high-quality short throw lens enable stunning, big screen results. Short throw lenses additionally reduce shadowing and spare attendees from the distraction of blinding lights. 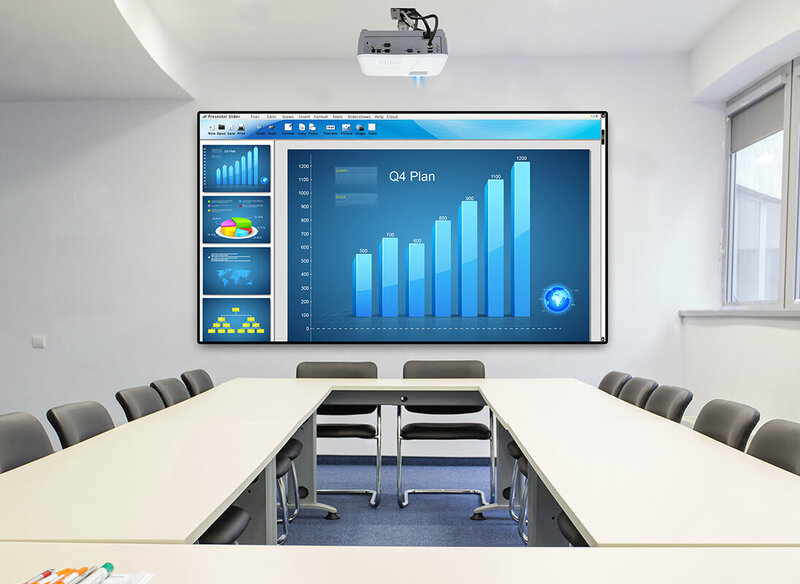 Ultra-short throw projectors build upon the advantages offered by their short throw predecessors, further enhancing the conference room environment through ultra-close installation that eliminates shadows, glare, hotspots and reflection. Interactive technology is one of the fastest growing projector categories and numerous studies have demonstrated improved engagement and meeting outcomes when it is employed. While the interactive whiteboard (IWB) is the most well-known of these technologies, interactive projectors have been offering a more cost-effective option since their introduction in 2009. Interactive projectors integrate technology that was once only available in an IWB. With these projectors, virtually any flat surface can become interactive, enabling users to write, draw, and annotate directly onto the projected image with interactive pens. Interactive software, which varies by manufacturer, can enable multiple users to simultaneously annotate, write, or draw on the projected image to interact with the content and share ideas. Other features may include background templates, copy-saving capabilities, and a reveal curtain or spotlight to highlight content. Typically, the interactive pens can also be used as a wireless mouse to conveniently drag or open files. Interactive projector solutions offer several advantages over traditional interactive whiteboards, not the least of which is a lower initial cost to implement. They can also be easily integrated with many existing IWB systems, for a cost-effective means of upgrading to more advanced projection capabilities. Whether looking for an interactive, short throw or networkable projector – or one that combines all three of these popular functions – several additional key features impact a projector’s overall picture quality, which tends to parallel cost. Most projectors are based on one of two technologies: DLP projectors (digital light processing) or LCD (liquid crystal display). DLP is the most commonly used projector technology for all types of applications, from basic to the most advanced. DLP also is generally the best value, offering an outstanding long-term TCO (total cost of ownership) thanks to filter-free designs that eliminate the need to clean and replace filters. Plus, a rarity of light engine failures more common to other technologies. Most projectors will include some type of technology designed to enhance color performance. One of the better known, BrlliantColor™ by Texas Instruments, is integrated in many projector brands. Some individual projector manufacturers offer proprietary technology designed to expand upon the familiar benefits of BrilliantColor, including ViewSonic’s unique SuperColor™ color wheel design, which delivers higher brightness levels and a wider range of true-to-life colors for an immersive viewing experience in any lighting conditions. The term "native resolution" (typically shortened to just “resolution”) refers to the number of pixels a projector has available to create an image. The first number represents the number of pixels in each horizontal row; the second is the number of pixels in each vertical column. Multiplying the two delivers the total number of pixels the projector can display; therefore, the higher the resolution, the more pixels. Higher resolution projectors can display a greater degree of detail and will reduce or eliminate visible pixelation, which delivers crisper viewing at a closer range; they also offer better compatibility with high-definition source content. For the most part, as resolution increases, so does cost. In general, for conference room use, a super-high resolution is not necessary for the type of material viewed; exceptions may include specialized business applications or industries with a heavy focus on media or highly detailed content. A related spec is a projector’s “maximum resolution.” Native resolution refers to the total physical number of pixels displayed by a given resolution. Maximum resolution refers to which content signal resolutions the projector is able to display. Because content is available in many different signals, each projector is programmed to recognize and process a number of these signals. Maximum resolution is the highest signal resolution that the projector is programmed to process and display. The process of converting signal resolutions that differ from a projector’s native resolution is referred to as “scaling.” When a projector receives a signal that has a higher resolution than its native resolution, the image will be compressed into fewer pixels. When a signal with a lower resolution is received the projector must expand the signal in order to display a full frame image. When source material is scaled there will always be a loss of signal quality, resulting in a somewhat softer image when compared to the same material displayed at its native resolution. This is particularly an issue with data projection, such as text, Internet content or spreadsheets, which suffers the most from being scaled. It is important to be aware that the resolution capabilities of any projector will be constrained by the native resolution of your source material. Low-quality signals will result in lower-quality images, regardless of the projector’s native resolution. The larger the screen, the more noticeable this will be. The best possible image quality will always be achieved when the projector’s native resolution is matched to the native resolution of your source material. When it comes to scaling video images, today’s technology can produce images nearly as crisp and clear as they would be displayed in native format. For display of data content, it is more critical to match a projector’s native resolution with the resolution of the source content. Contrast ratio is a measure of the difference between an image’s white and black components. For example, a contrast ratio of 1000:1 indicates that the black levels will be 1000 times darker than the white. Therefore, the larger a projector’s contrast ratio, the greater the difference between the brightest whites and the darkest blacks it can display. In general, as contrast ratios increase, so does a projector’s ability to create greater depth of image. An important specification for home theater projectors and other high-end use, a high contrast ratio is less critical to the needs of a typical conference room, since the benefits of high contrast ratios will only be noticeable in highly light-controlled, pitch-black rooms. For the typical multi-use office setting, where the projector will typically be used with some degree of ambient light, contrast ratios in the range of 4,000:1 – 10,000:1 will be more than sufficient to deliver a satisfying visual experience. This is the most critical factor to consider in determining the appropriate projector brightness level for your needs. The more light you have (or want) during viewing, the higher the brightness you’ll need to deliver a sharp, clear image. For most conferences rooms, presenters will want a moderate level of lighting during projection, to allow for eye contact, interaction and movement around the room. In these cases, a projector with a mid-range brightness level of 2,000-3,000 lumens will offer the flexibility to use the projector in a range of lighting conditions. However, if the room will always be darkened, or always be lit, you’ll want to choose a projector on either end of the brightness spectrum. Keep in mind that a projector bright enough to shine through a great deal of ambient light will be hard on the eyes in a dark room, whereas a low level of brightness will look washed out in a room with lots of ambient light. While a projector’s aspect ratio doesn’t directly impact the quality of the projected image, it is an important spec that determines the image’s shape and space occupied on the screen. 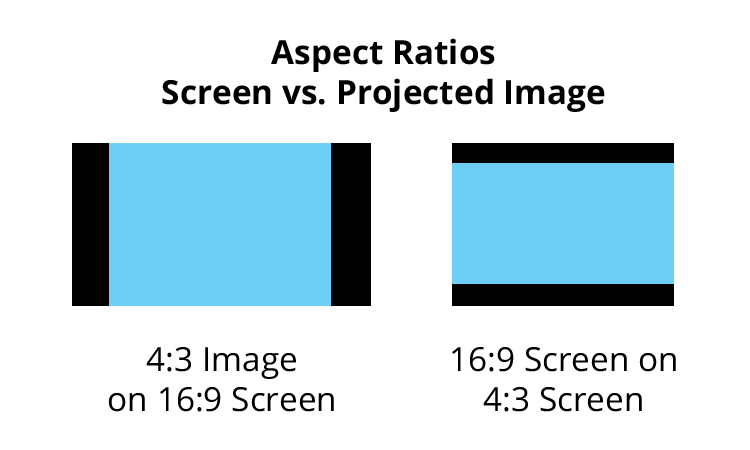 Defining the relationship between the width and the height of an image, aspect ratio is used to describe projection screens and content sources as well as projectors. For example, a 16:9 projector, projection screen or content source will have 16 units of width for every 9 units of height, resulting in a rectangular shape. Projectors, screens and content sources with a 4:3 aspect ratio will have 4 units of width for every 3 units of height, for an image that more closely resembles a square. As with resolution, challenges arise when a projector’s aspect ratio doesn’t match up with the aspect ratio of the source content. When the aspect ratio of the projector, projection surface, and content source are aligned, the image will fully cover the screen. When the viewing material does not match the native resolution of the projector, for example when watching 4:3 content on a 16:9 display, a portion of the screen will remain unused, resulting in black bars along the top and bottom or sides of the screen. Most business projectors today offer the popular 16:9 aspect ratio, which corresponds to the familiar HDTV standard and Full HD 1080p desktop displays for computing. However, cloud-based content, movies and other video content come in many different aspect ratio formats. For example, TV programs and videos intended for standard (non-HD) TV are developed in the legacy 4:3 format while content delivered on DVD comes in a wide range of formats. Given the lack of a universal standard for video content, it is highly unlikely that the aspect ratio of your projector will match up with all of the content presenters will want to display. Fortunately, most projectors have the ability to scale images (as discussed above with resolution) to fill all or most of the screen. While scaling does entail an inevitable loss of detail, this is generally quite minimal and is rarely noticeable when displaying video and images. If a particular presentation relies heavily on text-based content, then matching the projector aspect ratio with that of the most commonly used source material will be of greater importance. 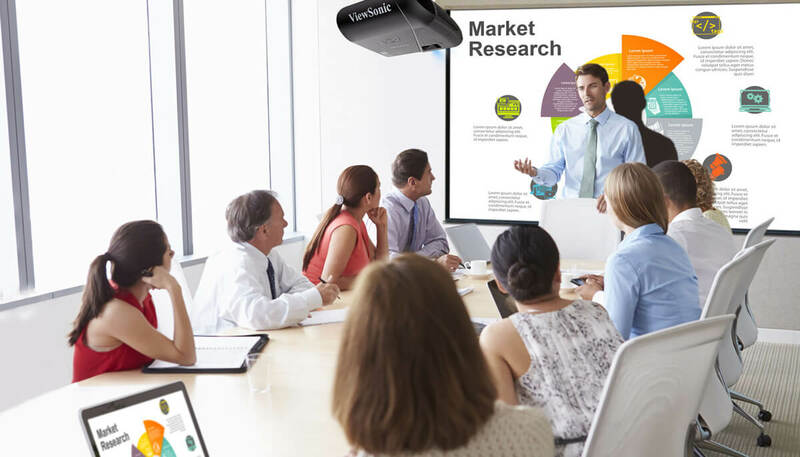 Not all projectors include audio and often those that do deliver a sub-optimal quality that’s difficult to hear throughout a conference room. Projector manufacturers often cite high wattage levels as an indication of sound quality. This, however, can be quite misleading, as wattage alone isn’t a reliable measure of speaker performance. Projectors that deliver great sound quality in addition to high-quality images will be designed and manufactured with both of these attributes in mind. While one HDMI port is a must for enabling source content connectivity, dual HDMI inputs offer added flexibility for easy setup and installation, with fewer cabling concerns. Enabling simultaneous connection of two HDMI-enabled video sources, such as digital cameras, smartphones, laptops, satellite boxes, and Blu-ray/DVD players, projectors with dual HDMI inputs minimize time spent switching between inputs. Most projectors offer at a minimum a VGA (analog) connector for a computer and a composite video connector for video equipment. If your computer has a digital output (typically an HDMI connector) you might want a digital connection on the projector as well, since it will eliminate any chance of problems like jittering pixels caused by poor signal synchronization. For video sources, the preferred connection choice is HDMI (assuming your video equipment has HDMI connectors), with component video a close second. Some projectors are now adding Mobile High-Definition Link (MHL)-enabled HDMI ports, which let you project from Android devices. The inclusion of a USB power port lets presenters use wireless HDMI dongles like Google Chromecast to easily stream multimedia content to supplement their presentations. Offering a new level of sharing and interactivity, streamed multimedia lets presenters display an endless array of material from their mobile devices while moving easily around the room for increased participation and interaction with attendees. Added features such as an integrated dongle compartment add to the ease of wireless multimedia streaming by keeping media dongles securely out of sight. While still uncommon in most office environments, 3D can be used to enhance specialized presentation content. Projectors with the latest HDMI technology deliver the highest picture and sound quality without degradation and can display 3D images directly from 3D Blu-ray players. Look for options like single button controls that enable preset preferences for brightness and other settings. One-button controls that dim screen brightness when your content is paused (along with automatic dimming when the projector is idle) will reduce power consumption and extend the life of the projector’s lamp – for an energy- and cost-saving enhancement that’s good for the environment as well as your budget. Smart design features can make using and maintaining projector easier and more enjoyable. Features including cable management hoods to reduce cord clutter (and tripping hazards) and easy-access lamp doors can save time, reduce frustration increase maintenance efficiency. The longer the lamp life, the lower a projector’s TCO, which can be an important factor in a heavy-use environment like a conference room.